I’m heading back from California today. It was a great, but tiring, 6 days away. I managed to stay relatively unplugged while I was gone- shocking! I did some work in the mornings while everyone else was still sleeping since my body is still on Central time. I did some pinning from my phone here and there, and checked in on email as they came in. It was nice to get away, relax, and not worry so much about the day to day things that I’m stressing out about. I’m currently sitting outside in my pjs on this cold, dreary morning in San Diego, but I’m thinking I would totally love to start most of my days this way. Over the last few months, I’ve been working on problem solving with a group of second graders and a group of third graders. I’ve been able to find some great resources for my 2nd kiddos, but not as much my third. So, I started creating some of my own. First, I introduced Problem Solving steps to them, so they follow a plan when they solve them. I got these from TpT for free. Click the picture to head there and check it out. Then, we were ready to solve! I created a few different sets. Each one has 24 different problems. I set them up to be versatile. They can be cut out and used as task cards. You can use them for Scoot or a Read the Room activity. I gave a recording sheet if you decide to use it that way. Or, I gave space for a name at the top and you can use it as a worksheet. Click on any of the pictures to check them out or buy them from TpT. 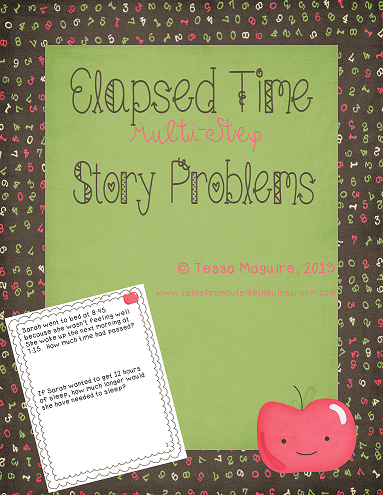 I also created Multi-Step Elapsed Time problems. 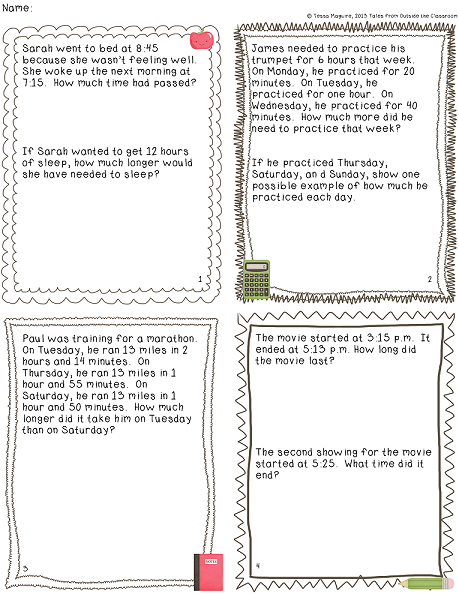 These are quite difficult and from the feedback I’ve received, people think these are too difficult for 3rd grade. I use them with mine, but we work at a higher level. So, keep that in mind. I’ll be continuing to create more and will probably bundle some at some point. I’d love to hear what you think about them! Just stopping by as I'm always inspired by your cute creations! I would be honored if you would assist me in my upcoming giveaway. I'm planning to celebrate my birthday month and gaining 200 blog followers! If you're able to contribute, please shoot me an email at rivas423@gmail.com with a snapshot of your product and/or your blog button so I can send them over to visit your page as well! Anything end-of-the-year, May-themed, or just stinkin' cute would be great! These look great! Makes me want to teach 3rd grade again! WOW, what awesome freebies..thank you so much! I agree so much. The more we practice reading and the more we practice WP the better they will become overall. Great freebies. Thanks.